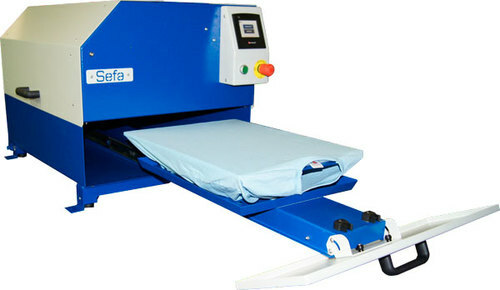 Sefa iSpray 2 Pre-Treatment Machine for DTG. This machine has nozzle selection capability (right/left or both at the same time), for accurate and consistent spraying precision and minimal waste of pre-treatment liquid. The recycling tank also reduces liquid waste when cleaning. Large space around plate provides capability to spray-treat large garments, although a junior plate is available for treating smaller garments. Optimize your direct to garment printings on dark T-shirts. Consistent and uniform pre-treatment spraying. Automatic cleaning cycle and nozzle moisturizing.